Integral LED Linear 6.5W 118mm Cool White 850lm is rated 4.4 out of 5 by 20. Rated 5 out of 5 by Jesse O from Perfect fit Perfect replacement for existing halogen although not as bright. 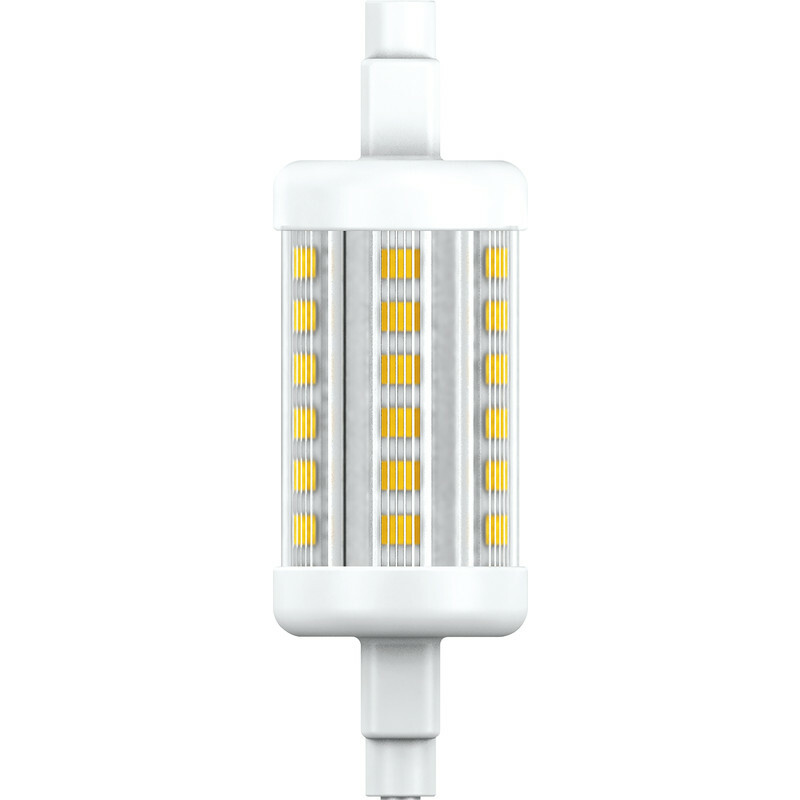 Rated 5 out of 5 by MetalMania from Brilliant Great replacement LED lamp for security light. The box states equivalent to 85W and it does produce a great amount of cool/white light. The LED's themselves are surrounded by a plastic cover - so should last years. Rated 4 out of 5 by Lampbuyer from Energy efficient, but not very bright At 5.2 watts, this replacement lamp for my outdoor security light is very energy efficient, particularly as it replaced a 300 watts old style halogen lamp. However, it is not as bright. Arguably, the old lamp was too bright, but this one is only just bright enough to illuminate my garden. Overall, it's 4 stars not 5 for me. Rated 3 out of 5 by Dogowner from Works eventually This lamp has square portions at each end making it a tight fit into my holder. It worked eventually, after a bit of fiddling. Quite a low light output but OK for me for confined space working without too much heat. Rated 1 out of 5 by Rick22 from Replacement required Worked for a week forced to buy a quarts Halogen replacement. Rated 5 out of 5 by Jack_Regan from Bright light Replaced a 500w lamp in a work light for this LED lamp. Very little heat is emitted from the lamp (or housing) making it safer to work around and it saves me money!! Instant light when switched on. Have rated it 5 stars for reliability but I have only owned it for a couple of weeks with daily use with no issues.